Last weekend I launched my first entirely-self made project. Entitled Waybinder, it is a work of interactive fiction which I developed over the course of a few months. Just as with the other games I’ve worked on in the past 10 years, the process has been educational. But as well as being in a genre which is new to me, this endeavour has given me a lot to think about in terms of project scale, working with narrative, and even new angles on self-publishing. It would of course be remiss of me not to suggest that one can discover what Waybinder is about by playing it. I released the game for free/donations on Itch.io, and because it is browser-based, it can be played on whichever device you’re using to read this article. But to summarise: I describe this as ‘an interactive novella’ given that Waybinder is text-based, and much more narrative than ludic. The ‘game’ aspect of it comes through in the choices you make, and in a lightweight set of encounters with the Scots Gaelic language. Its overall plot culminates in a ritual which has variable outcomes. I started out with a few rough passages written in freeform style, to establish the protagonist and understand the tone I wanted to strike. 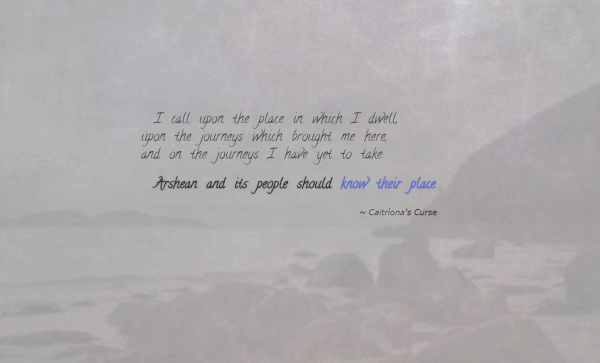 These included the train journey into Baile Arainn (pacing), meeting the city’s Director (character interactions), and the train crash at Arkillen (action). By this point I already knew that the project would skew heavily towards prose, and that interaction would be facilitated by buttons containing short dialogue and actions. Having now referred to a number of locations in this rough draft, I looked to a transit map I’d drawn up for the Metrowitch project. This formed the basis of a more detailed map, which I would draw alongside writing the game over the next few months. I identified key locations I’d want the player-protagonist to visit over the course of the game, establishing what events might happen there and how they might be connected. 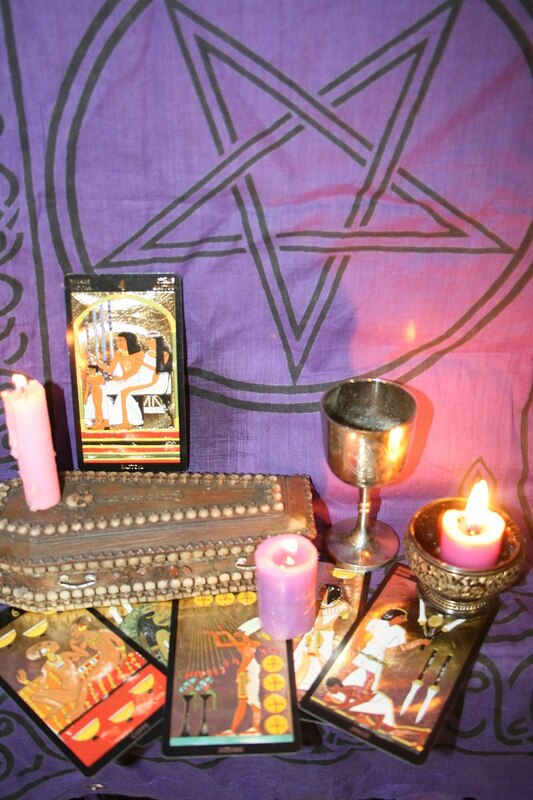 This is also where I began to get some idea of possible mechanics, motivations and forms of ritual to be played out. What followed was the bulk of the work: alternating between cartography and narrative design, making use of flowcharts and copious notes. I explain this in more detail later. Finally, there was about a month of proof-reads, bug-fixing, story polish and UI work on the game’s presentation in HTML5. I worked to a checklist of features, either implementing them or crossing them off after realising they’d require a more substantial re-write of Twine’s engine than I was willing to commit to. Though I have worked narrative design before, most of the games which called for it were much more mechanical in nature than Waybinder is. In A Planet Wakes, for example, the narrative drives players from one terraforming site to the next and makes the effort feel more intense each time. But the game and environment still tell the game’s underlying story, even when this narrative is removed. As mentioned before, I used plot notes to manage much of this — not least those which describe the game’s variables. I also considered a flowchart, but at first this presented me nothing more than an intimidating blank canvas. It was at this point I realised I could incorporate ritual into the game’s design as well. Fearing that even these few story beats might spill over into a much larger game, I designed what would turn out to be 80% of the final game as the first of at least two ‘acts’. I began with the rough draft of Waybinder‘s story, which established one possible path. I based other branches upon four tarot cards, drawn at random. The imagery from these is what’s shown on the game’s UI, and one particular branch (The Magician) is directly referred to by one of the game characters. Each of these was drawn with only one goal in mind — to put the player in a particular frame of mind (hopefully the same as my own) when they would come to perform the ritual at game’s end. I subtly re-interpreted these four cards (I: Magician, Queen of Pentacles, Page of Pentacles and Queen of Swords) in order to establish loose ‘moods’ for each branch: pro-activity, focus on details, and warding one’s self and others. The path I’d already laid out focused on character interactions, and an encounter from the protagonist’s past; this seemed a good fit for the two ‘warding’ branches. The other two branches would engage more with the world and events happening within it. It’s here that I also devised the idea of using artefacts for the actual ritual. These would act both as a focal point for the player, and an easy means of tracking which path they had taken. This would prove useful for later, diverging conversations. Real-world examples of artefacts found within the game: a chair screw, railway token, sprig of heather and wild thistle. 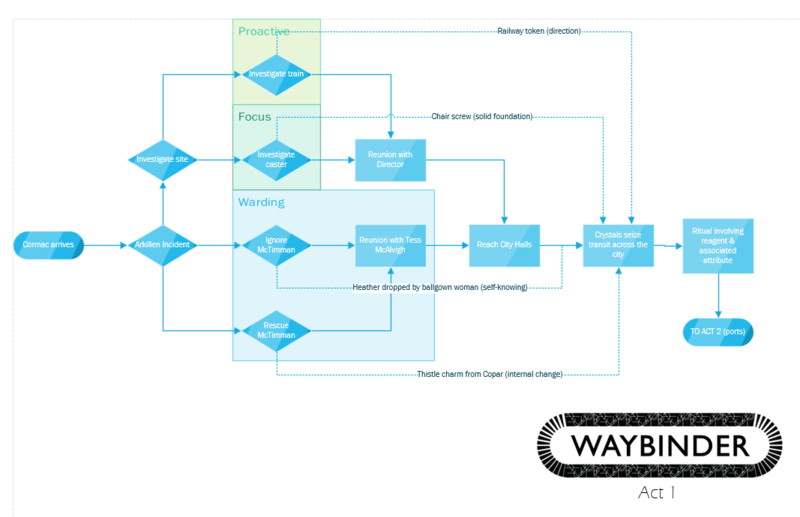 All of this has happily led to Waybinder‘s completion and release. I kept it a small undertaking, making use of Itch.io’s platform with a smattering of promotion via bespoke Twitter and Instagram accounts. I have also begun submitting it to relevant games festivals in the hopes I might glean wider feedback, but also to see how play-testing is likely to be different. 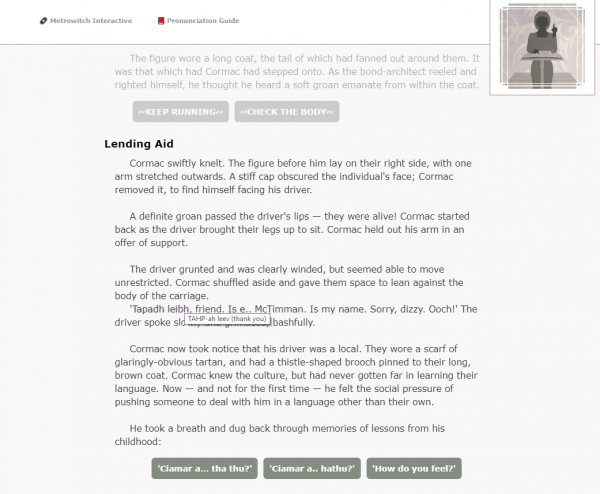 I’m conscious (in theory if not in practice, yet) of the ways in which a piece of interactive fiction could succeed or fail at engaging its players, keeping them entertained, and bringing their time and effort to a satisfying conclusion. These factors are true for all interactive media. This is, however, by far the most ‘authorial’ project I’ve made. Its interface and play sessions also call for a different level of engagement, as it’s not a piece of work which could easily or satisfactorily be demonstrated within 1 or 2 minutes. My basic hopes are that Waybinder is entertaining, and that the lessons I learned (and can now demonstrate) from its making may continue. I certainly intend to incorporate more narrative design into my generalised game design toolbox. Waybinder has, however, also served its initial purpose: to help realise an imaginary world which I intend to keep exploring. 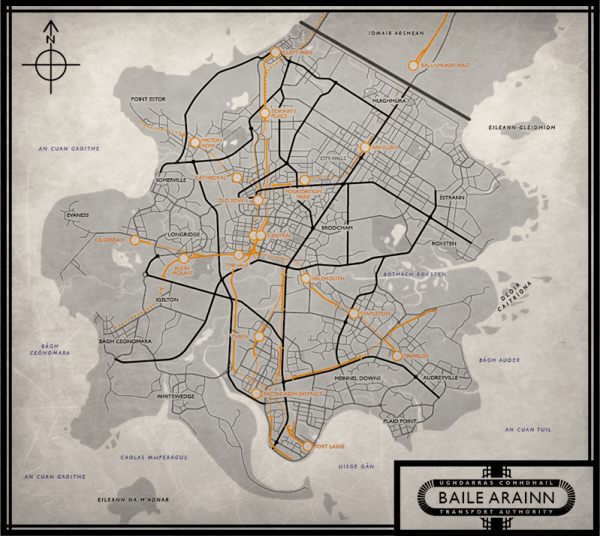 My next solo project began before this one: a 3D adventure, set some hundred years in Baile Arainn’s future. Having never before had a game world I could explore from multiple angles, I look forward to whatever lessons come from that as well.